Toonies for Tummies 2015 - "Small Change. Big Change"
2) Improve the lives of those in need. - In Canada, 1 in 7 children start the school day on an empty stomach due to a lack of access to nutritious foods. - Canada is currently the only G8 country without a national nutrition program in schools. Nutrition programs that currently exist are funded by sources including Breakfast for Learning and Breakfast Clubs of Canada. Did your list of "wants" suddenly become incredibly insignificant? Mind did. Do you want to become a better person and improve the lives of those in need? I do! Do you want to give back? YES! If you're in with me on this, then PLEASE READ ON. Toonies for Tummies (Twitter: @Toonies4Tummies, Facebook: Toonies For Tummies) is an in-store retail fundraising effort organized by The Grocery Foundation on behalf of food, beverage and consumer goods manufacturers, distributors and retailers. The campaign is designed to raise money to help fund nutritious breakfasts and snacks to children in various programs including school nutrition programs in Ontario and in Atlantic Canada. When you shop at participating retailers* from February 5-19, you will be asked to consider donating a TOONIE. Yes, believe me when I say your TOONIE will make a difference! In 2013, funding from Breakfast for Learning and Breakfast Club of Canada - Canada's two largest national organizations which combined helped serve 56 million meals and snacks this school year - provided support for 355,000 children between the ages of 4 and 18 benefiting from school-nutrition programs coast to coast. According to Breakfast Club of Canada and Breakfast for Learning, the average cost of a nutritious breakfast provided by these programs is just under $2. 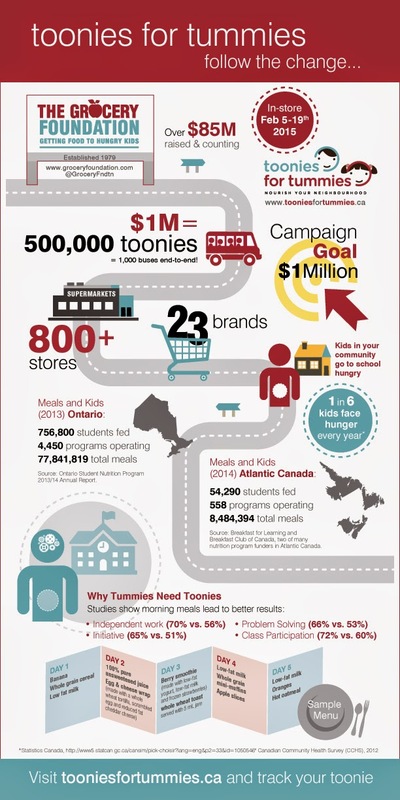 Toonies for Tummies raised $864,000 for kids in 2014 and if we all do our part this year, we can help The Grocery Foundation (Twitter: @GroceryFndtn, Facebook: The Grocery Foundation) in reaching their $1,000,000 goal! Monies in Ontario will go to 53 regions and in Atlantic Canada, and 100% of the monies raised will go to the programs who receive funding from The Grocery Foundation like Breakfast for Learning, Breakfast Club of Canada as well as the Boys and Girls Club. It has been proven time and time again that breakfast is the most important meal of the day, but there are a variety of reasons why children arrive to school hungry, including poverty, lengthy commutes, a hectic family routine in the morning, and children not being hungry when they first get up in the morning. And this is why student nutrition programs are so important in that they provide health benefits (promote good health and eating habits), academic benefits (hungry children's capacity to learn is diminished), student success (improved academic performance), social benefits (positive social skills are fostered through peer to peer relationships) and economic benefits (investing in children's health is likely to yield positive returns). And really, how can you deprive these adorable kids from their breakfast? Watch this quick video and see these kids bring the Toonies for Tummies message to life. As a "thank you", sponsoring companies taking part in the Toonies for Tummies campaign will provide donors with a coupon booklet at the till when a $2 donation is made. This coupon booklet will give you incremental future savings off sponsoring company products**. The Grocery Foundation encourages donors to take full advantage of this booklet and show their support of the companies that are making the 2015 Toonies for Tummies campaign possible. The booklet includes coupons from participating sponsor companies and will be available while quantities last. Interested in seeing where your money goes? 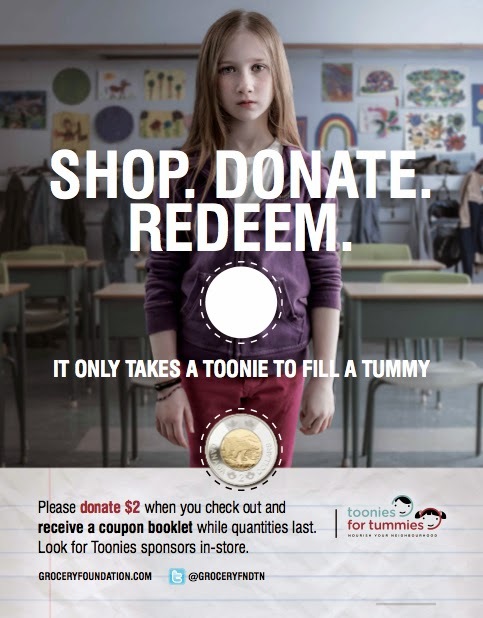 All you have to do is visit the Toonies for Tummies website, and there you can use the "Toonie Tracker" to track your donations back to local schools. Your Toonie will make a difference. Toonies for Tummies. 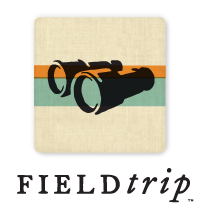 February 5-19th, 2015. A. Lassonde, Burnbrae Farms, Campbell Co. of Canada, Canada Bread, Catelli Foods Corp., ConAgra Foods, HighLiner Foods, Kraft Canada, Mondelez Canada Inc, Nestle Canada Inc., Olymel SEC, Parmalat Canada, PepsiCo Beverages, PepsiCo Foods, Scotsburn Dairy Group, Tree of Life Canada, Ultima Foods, Weston Bakeries Limited, Wrigley Canada.